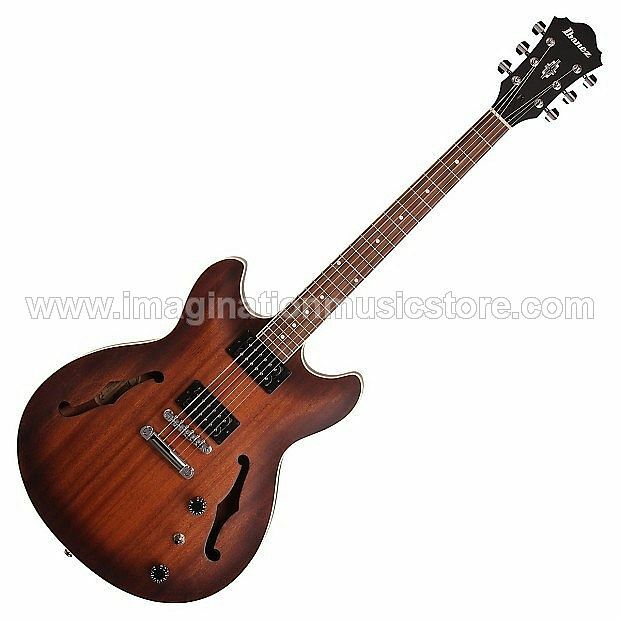 With its classic design the Ibanez AS53 semi-hollowbody electric guitar gives you the comfort of a smaller body and modern sound for an amazing low price. The sapele top, back, and sides offer plenty of warmth and punch, and the mahogany neck is fast and comfy. The AS53's body is about the size of a traditional solidbody guitar, making this guitar extremely comfortable to play. A pair of humbuckers can take your amplifier from sparkle to snarl in the blink of an eye. When you're on a budget and need a whole lotta bang for the buck, you won't be disappointed with the Ibanez AS53 semi-hollowbody electric guitar. Solidbody players sometimes shy away from semi-hollowbody guitars due to the size even though they want the tone. The Ibanez AS53 crosses that barrier with a smaller body that is comfortable to solidbody players, but is still a true semi-hollowbody guitar. Using the classic maple body and mahogany neck combination, the AS53 gives you the semi-hollow sound you want. No more having to get used to oversized and uncomfortable guitars for great tone. The Ibanez AS53 is the perfect culmination of tone and size. Ibanez designed the AS53's Infinity R pickups to give you warm and well-balanced tone. They really bring out the depth and tonal complexity in the AS53's all sapele body. At the same time, Infinity R pickups do an amazing job suppressing noise and reducing the feedback that tends to plague semi-hollowbody guitars. Semi-hollowbody guitars are used in most genres of music. The AS53 is great for jazz, rockabilly, and many other styles of music. Don't forget that hollowbodies have also been used in rock 'n' roll, fusion, and even country bands. Get the Ibanez AS53 and start playing with big, fat hollowbody tone today! Get sweet semi-hollowbody tones with an Ibanez AS53!